Strong, sustained economic growth is an important ingredient in putting the debt on a sustainable course. In addition to increasing incomes and raising standards of living, faster economic growth can increase federal tax revenue and raise the nation's capacity for holding debt. For that reason, any comprehensive agenda to repair the nation's ailing long-term fiscal outlook will likely require reductions in future spending, increases in future taxes, and faster economic growth. Recent economic news has been good – the Bureau of Economic Analysis estimates that the economy grew at a 4.1 percent annualized rate last quarter and is on track to grow at roughly 3 percent for the year – but long-term projections still show an economy growing at less than 2 percent annually, largely due to slower labor force growth from an aging population. Lawmakers should therefore adopt an agenda to hold onto near-term economic gains and improve our long-term growth outlook. In June, CBO published its "rules of thumb," showing how future deficits and debt would change due to changes in economic growth, interest rates, or inflation. CBO also published an Excel model that allows users to apply these rules of thumb themselves. Under CBO's latest projections, growth will average 1.8 percent over the next decade and debt held by the public will reach a post-war record 96 percent of GDP by 2028. 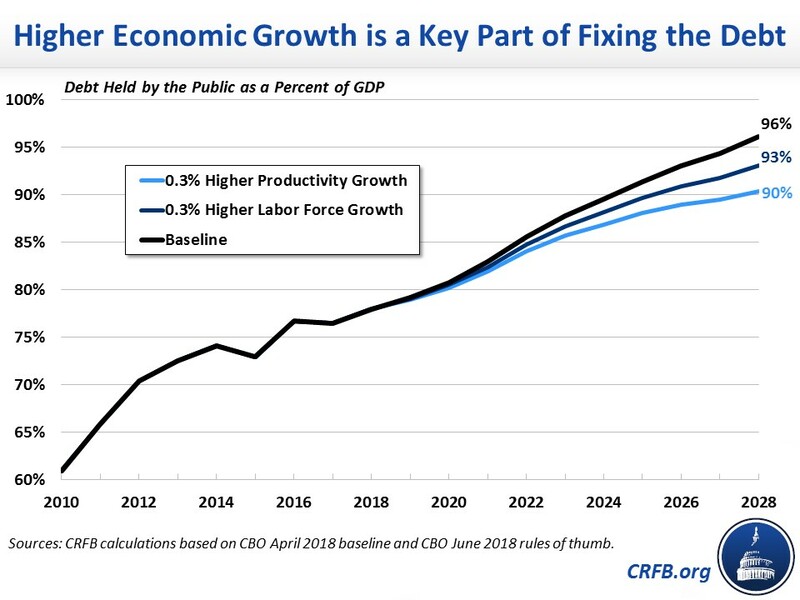 CBO's rules of thumb model allows users to change productivity or labor force growth in order to change the assumed growth of the entire economy. Based on CBO's model, increasing growth in the labor force by 0.3 percentage points per year over the next decade – from 0.5 percent to 0.8 percent annually over the next decade (including from 0.3 to 0.6 percent later in the decade) – would both increase output and reduce deficits. Under this scenario, average annual GDP growth would increase by 0.2 percentage points (from 1.8 to 2 percent) and GDP would be 2 percent higher over the decade. As a result, deficits would be about $350 billion lower over a decade, and we estimate debt would rise to 93 percent of GDP by 2028, rather than 96 percent. Similarly, increasing productivity growth by 0.3 percentage points – from 1.1 percent to 1.4 percent annually – would boost average annual GDP growth by 0.4 percentage points (from 1.8 to 2.2 percent per year) and reduce deficits by $700 billion over a decade. As a result, we estimate that debt held by the public would rise from 78 percent of GDP in 2018 to 90 percent by 2028, 6 percentage points lower than under the baseline parameters. While neither of these scenarios is easy to achieve, both are plausible with the right set of reforms. The labor force increase is roughly consistent with what would occur under the Senate's 2013 immigration bill, and the productivity boost would lift productivity to its 50-year historic average. Ideally, policymakers would pursue an agenda to increase both productivity and labor force growth, as well as the amount of capital in the economy. Roughly speaking, we believe increasing all three by 0.3 percentage points per year would reduce projected debt levels to between 85 percent and 90 percent of GDP. Importantly, the source of growth matters. If faster growth is the result of deficit-increasing tax cuts or spending, the net effect will almost certainly be to worsen the fiscal outlook. But as CBO's model shows, any improvement in sustained growth – all else equal – is likely to improve our fiscal outlook and is thus an important ingredient in fixing our debt situation. Though strong growth over the past year is largely the result of an economic sugar high, it is important to acknowledge that some improvements have been made to the country's long-term economic prospects. 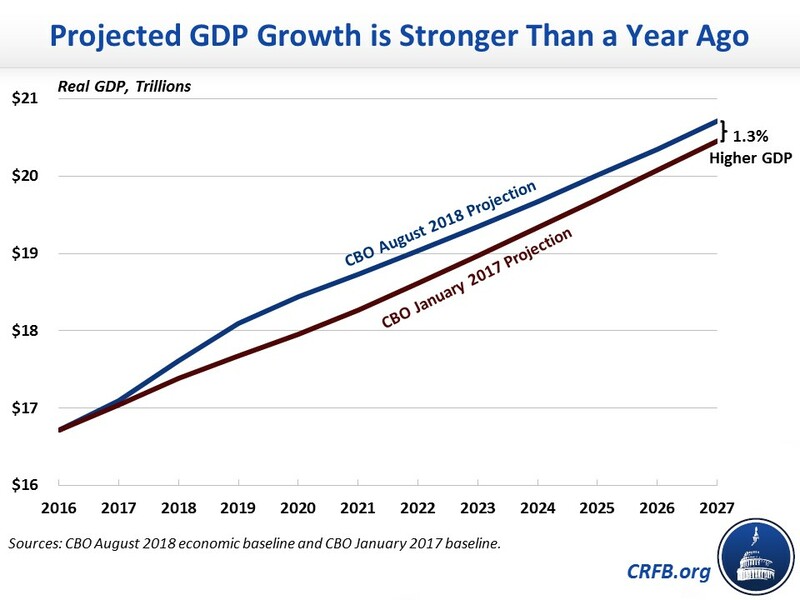 Under current law, CBO's latest economic forecasts show that the level of GDP will be about 1.3 percent larger in 2027 compared to its projections in January 2017. In other words, the economy is now projected to grow 0.1 percentage points faster per year on average than it was projected to in January 2017. One likely reason for this improved growth is the 2017 Tax Cuts and Jobs Act, which CBO estimates will boost average growth by about 0.06 percentage points per year over the next decade through increases to the capital stock and labor force growth. Most other forecasters expect similar results. While this boost in GDP growth is certainly welcome, the tax bill was in many ways a missed opportunity to go further. By adding as much as $1.9 trillion to the debt, the bill will crowd out investment, offsetting many of the would-be growth effects. In addition, many of the law's pro-growth provisions are set to expire at various points over the next decade. A fiscally responsible and permanent tax reform bill would have been far more pro-growth. Another possible source of faster growth is the looser regulatory environment. As CBO noted in its recent update, "recent shifts by the Administration and the Congress toward deregulation and a looser regulatory environment are expected to boost investment, and thus potential output, modestly in the long term." In its April economic update, CBO attributed the changes in regulations on financial products, energy production, Internet service providers, and health insurance markets as possibly improving potential output through investment incentives and lower production costs. However, economic headwinds risk undermining this success. The tariffs or trade wars, tight immigration policy, increased uncertainty, and exploding deficits all threaten to slow economic growth. In fact, CBO believes real gross national product will be 1.2 percent smaller in two decades if the country undertakes new borrowing to extend the recent tax cuts and spending bill, despite the positive effects of making temporary tax provisions permanent. And CBO has already identified uncertainty surrounding U.S. trade policy as a potential threat to further growth that they are closely monitoring. Rather than pursuing anti-growth policies, lawmakers should be supporting a pro-growth agenda. Such an agenda could include increasing labor force growth – through immigration, by promoting work, and by encouraging delayed and flexible retirement for those who are able to continue working. It should include improving and perhaps increasing public investment in infrastructure and human capital in a thoughtful and responsible way. It should include fixes to the tax bill so that it better promotes work and investment without adding to the deficit or including arbitrary expirations. And it should, of course, include measures to slow the unsustainable growth of the national debt so it doesn't crowd out private investment and put the country at risk of an eventual fiscal crisis. CBO and others have estimated the impact of some pro-growth policies, though for many others more analysis is needed. Note: most of these estimates were for a given growth over a specified period (e.g., the economy would be 1 percent bigger after ten years). For comparison, we converted all to a compound annual average growth rate, generally using ten-year scores over the period when the policy was implemented. *Shale boom indicates estimates of the effect of the previous boom in shale exploration (which are already included in the baseline). ^CRFB rough estimate based on CBO and other analysis of the tax law. CBO = Congressional Budget Office; U.S. ITC = U.S. International Trade Commission. As CBO's rules of thumb show, pro-growth policies can do a lot to improve our fiscal situation, but they need to be at least deficit-neutral to avoid being counterproductive. And even an aggressively pro-growth agenda won't replace the need to slow the growth of spending, increase revenues, or more likely both. But it can help make our other fiscal choices easier and increase incomes and welfare for Americans across the country. That is certainly something to aspire toward.